This meta-analysis evaluated the tuberculosis (TB) risk of all TNF-α antagonists across a variety of conditions in randomised controlled trials (RCTs) with low heterogeneity. In addition to the diseases most commonly treated by TNF-α antagonists (rheumatoid arthritis, ulcerative colitis, ankylosing spondylitis and psoriatic arthritis), the review included studies that involved patients with asthma, sarcoidosis and graft-versus-host disease. The quality of the evidence was assessed using the GRADE approach, which has been recommended for grading evidence by the British Medical Journal since 2006. The relatively short follow-up period in the RCTs might have caused an underestimation of the TB rates. To date, five TNF-α antagonists have been used in clinical practice: etanercept, adalimumab, infliximab, golimumab and certolizumab pegol. Although their therapeutic efficacy has been confirmed, the side effects of these TNF-α antagonists need to be considered carefully in clinical practice.8 An increased risk of tuberculosis (TB) among patients receiving TNF-α antagonists has been observed,9 and several meta-analyses have evaluated the risk of TB in patients treated with TNF-α antagonists or with specific conditions.10–13 Nevertheless, the association between TNF-α antagonists and an increased risk of TB remains uncertain. With the aim of further clarifying the issue, this meta-analysis compared the risk of TB between TNF-α antagonists treatment and control groups in randomised controlled trials (RCTs) focusing on any disease condition. A secondary objective was to investigate the association of the rate of active TB with the type of medication, the disease condition and the location of study. Participants: Adults (aged 16 years or older) with any disease included in studies of any of the five TNF-α antagonists. Interventions: TNF-α antagonists ETN, ADA, IFX, GOL or CZP with or without standard-care treatment for any medical condition. Comparators: Placebo with or without standard-care treatment or standard-care treatment alone. Outcomes: Diagnosis of TB, TB reactivation, miliary or cavitary TB of the lung or any other body organ. The exclusion criteria included: (1) duplicated studies or studies based on unoriginal data, (2) studies that did not report TB incidence, (3) studies that did not observe TB events and (4) articles not published in English. We systematically searched for reports of trials and systematic reviews up to December 2015 from the following online databases: MEDLINE, Embase and Cochrane Library. No restrictions were imposed with regard to region and time. To identify all RCTs, a highly sensitive search strategy developed on the basis of Cochrane Handbook for Systematic Reviews of Interventions was applied, which combined with the following key terms: ‘etanercept’, ‘adalimumab’, ‘infliximab’, ‘golimumab’, ‘certolizumab’ and ‘TNF-α antagonist’ (The MEDLINE search strategy is provided in online supplementary appendix 1). In addition, the reference lists of all topic-related review articles, reports or meta-analyses were searched for potentially relevant studies. Two reviewers independently screened the titles and abstracts of all records retrieved by the searches and identified studies that were potentially eligible for inclusion. Full-text versions were obtained, and these were independently assessed for eligibility by two reviewers according to inclusion and exclusion criteria. Disagreements between reviewers at both stages of screening were resolved by discussion and consensus. Data extraction was conducted independently by two investigators, and discrepancies were resolved through discussion. For each included study, we extracted essential information, including publication details, sample size, characteristics of trial participants, timing of assessment, interventions/comparisons, incidence cases of TB, performance of TB screening prior to therapy and geographic location of the study classified according to the incidence rate (IR) of TB (WHO, incidence TB estimation, 2014). Countries with an IR ≥40/100 000 are considered as high-incidence TB areas. The methodological quality of all included RCTs was assessed using the Cochrane collaboration's tool. The tool contains seven dimensions: random sequence generation, allocation concealment, blinding of participants and personnel, blinding of outcome assessment, incomplete outcome data, selective reporting and other bias. Studies were considered as low risk of bias when all these key aspects were assessed to be at low risk. Principal statistical analyses were performed using Review Manager 5.2 software according to the Cochrane handbook. On the basis of events reported by included studies, the number of patients developing TB was compared between the placebo-controlled or standard-care populations and patients receiving at least one dose of TNF-α antagonists. Statistical heterogeneity among results was evaluated by using the I² statistic with the significance level set at 0.1. Meta-analyses were performed using the random-effects model. Results were presented as OR and its 95% CI. An OR >1 suggests a higher risk of TB than the control. Publication bias was tested by funnel plots, Egger's regression method and Begg's rank correlation method, using Stata software (V.11.0, College Station, Texas, USA). To evaluate the influence of all single studies on the pooled outcome, we also performed sensitivity analysis through the leave-one-out approach. Stratified analyses were performed by type of medication, disease being treated and estimated TB rates of studies' geographic locations. We assessed the quality of evidence using the Grades of Recommendation, Assessment, Development and Evaluation (GRADE) methods.15 GRADEprofiler 3.6 software was applied to create the evidence profile. The GRADE approach categorises the quality of evidence as follows: (1) high quality (further research is extremely unlikely to change the credibility of the pooled results); (2) moderate quality (further research is likely to influence the credibility of pooled results and may change the estimate); (3) low quality (further research is extremely likely to influence the credibility of pooled results and is likely to change the estimate) and (4) very low quality (the pooled results have extreme uncertainty). A total of 6843 study records were identified following the search strategy; 2773 references were left after removing duplicates. After title and abstract screening, 187 references progressed to the next stage, in which articles were re-evaluated based on full texts. 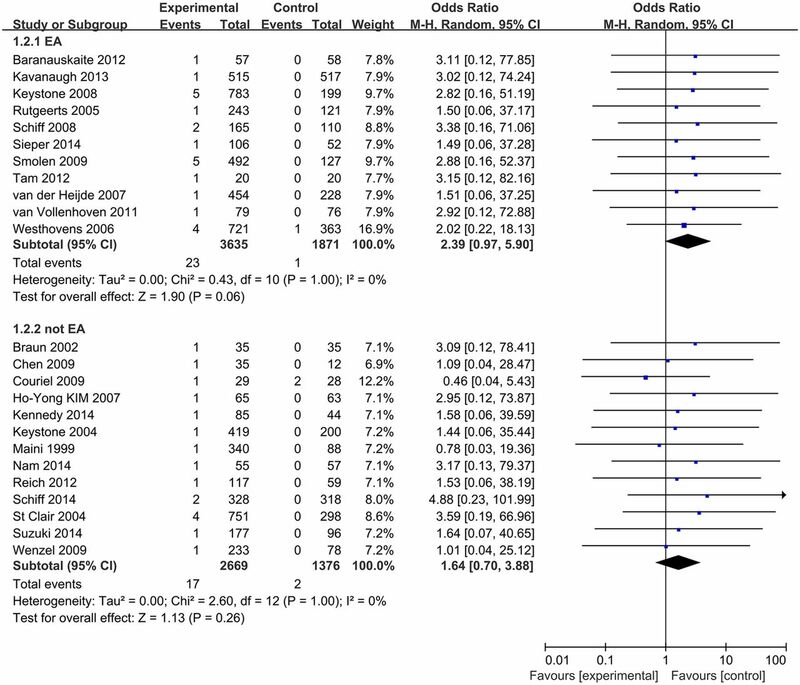 Ultimately, 27 RCTs met the inclusion criteria and were included in our meta-analysis. In addition, two records were added after checking the references of previous systematic reviews.16 ,17 The PRISMA flow diagram of study selection is presented in figure 1. The 29 included studies involved a total of 11 879 patients.16–44 The duration of outcome assessment in included studies ranged from 8 weeks to 3 years. Fourteen trials assessed infliximab, two trials assessed golimumab, nine trials assessed adalimumab, one trial assessed etanercept and three trials assessed certolizumab pegol. Thirteen RCTs were in areas with a low IR of TB and eleven in areas with a high incidence; this information was unavailable in the remaining five RCTs (table 1). TB screening was reported in 26 RCTs but was not carried out in 3 trials. A total of 45 TB cases occurred among 7912 patients treated with TNF-α antagonists and only 3 cases developed in 3967 patients in the control groups (see online supplementary appendix 2). The methodological quality assessments of included studies are summarised in online supplementary appendix 3. Pooled analysis determined that treatment with TNF-α antagonists was associated with an increased occurrence of TB compared with control groups (OR 1.94 (1.10, 3.44), p=0.02; figure 2). No significant heterogeneity was detected (I²=0%). The funnel plot revealed no obvious asymmetry in distribution, suggesting a low likelihood of publication bias (see online supplementary appendix 4), and this was statistically confirmed by Begg's test (p=0.348) and Egger's regression asymmetry test (p=0.321). Sensitivity analysis using random-effects model suggested that pooled result was not affected substantially by any of the included studies (see online supplementary appendix 5). 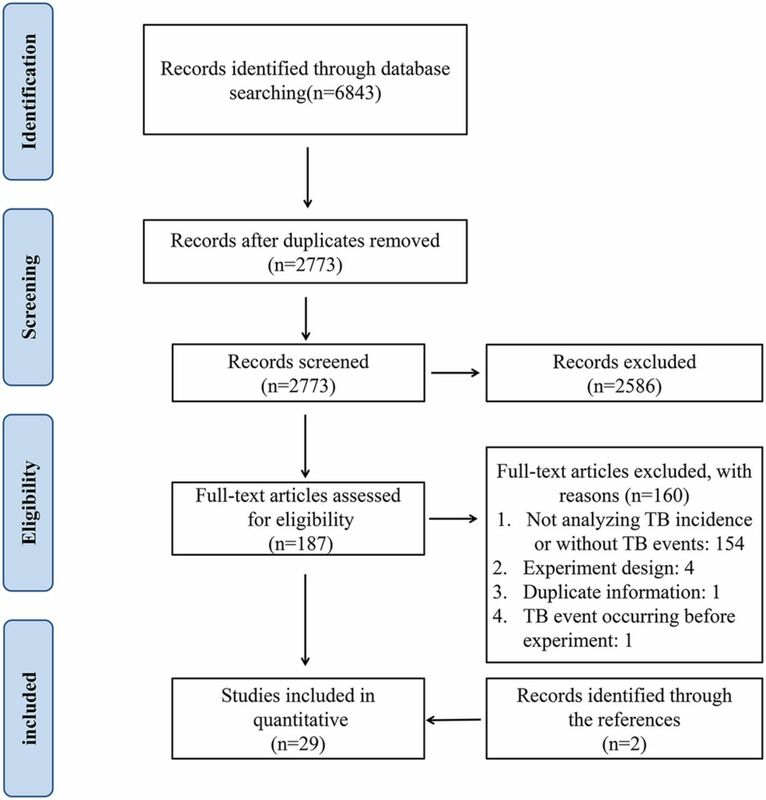 Meta-analysis of TB risk associated with TNF-α antagonists. TNF-α, tumour necrosis factor-α; TB, tuberculosis. We performed subgroup analyses based on type of medication, disease under treatment and TB rate of the geographic location. In these analyses, the type of drugs was not associated with statistically significant differences in the risk of TB between patients treated with TNF-α antagonists and control groups (IFX: 1.82 (0.82–4.06), ADA: 2.11 (0.73–6.12), CZP: 2.38 (0.42–13.42)) (see online supplementary appendix 6). When grouped for disease, a significantly increased TB risk was associated with anti-TNF-α drugs in RA patients (OR 2.29 (1.09 to 4.78), p=0.03) (figure 3). When analysed according to estimated TB rates of studies' geographic locations, ORs for studies in high or low TB rate areas were 2.39 (95% CI 0.97 to 5.90, p=0.06) and 1.64 (95% CI 0.70 to 3.88, p=0.26), respectively (figure 4). Subgroup analysis of TB risk in RA and AS patients. AS, ankylosing spondylitis; RA, rheumatoid arthritis; TB, tuberculosis. Subgroup analysis of TB risk in high or low TB rate areas. TB, tuberculosis. The results of assessing the quality of evidence are shown in online supplementary appendix 7. The quality for the main result was recommended as ‘low’ by the GRADE system. TNF-α antagonists have been widely used in many rheumatic diseases due to their considerable therapeutic effects and are promising candidates for future clinical applications in many other relevant diseases.7 ,24 However, an increased risk of TB has been observed among patients receiving anti-TNF treatments,9 an issue that has been highlighted by WHO in a black box warning for TB and other opportunistic infections. This meta-analysis aimed to consider TB risk in any patient treated with TNF-α antagonists, with the premise that the adverse event profile of TNF-α antagonists would be similar irrespective of the condition being treated. Twenty-nine published RCTs involving 11 879 patients were eventually included. In addition to the diseases most commonly treated with TNF-α antagonists (RA, UC, AS and PsA), this review also included studies that involved patients with asthma, sarcoidosis and Graft-versus-Host disease (GvH). We found that the risk of TB was statistically significantly increased in patients treated with TNF-α antagonists. With patients being treated with any TNF-α antagonist for any disease included, the risk of TB was almost doubled compared with those in normal care or placebo comparator arms. This result is in accordance with previously reported suspicions that TNF-α antagonists could increase TB risk, but differs from the findings of two previous meta-analyses on this topic, which found no significantly increased TB risk among patients with chronic immune-mediated inflammatory diseases or RA treated with different TNF-α antagonists.10 ,11 One possible reason for this discrepancy may be the relatively small number of patients included in those meta-analyses. In order to take into account the effects of disease condition and the rate of TB in the background population on the pooled results, subgroup analyses were performed. When patients with RA were considered alone, the level of increased risk of TB in RA patients receiving TNF-α antagonists, compared with placebo or normal care groups, was higher than the increased risk among patients in any disease condition. Although it has been reported that RA patients showed an increased risk of TB when compared with the general population,45–47 the potential for anti-TNF drugs to increase this risk further should not be ignored. It was also expected that patients in endemic areas would have a higher risk of TB after treatment with anti-TNF agents. While the difference in TB incidence between anti-TNF treated patients and control groups was not statistically significant (p=0.06), the trend towards higher incidence was enough to suggest the likelihood of a repeatable difference, which indicates that safety studies should include patients from these areas to provide a true profile of the risk of infection. No differences in TB incidence were identified between anti-TNF-treated patients and controls when subgroup analyses were conducted by single drug types. However, it is likely that this is a result of the small number of included patients. TNF-α is an immune mediator that plays a critical role in protective mechanism against infections, especially TB. TNF increases the phagocytic capacity of macrophages and enhances intracellular killing of mycobacterium via the generation of reactive nitrogen and oxygen intermediates, effectively synergising with interferon (IFN)-γ.48 TNF-α is also involved in the pathological changes of latent tuberculous infection (LTBI), especially in maintaining the formation and function of granuloma which prevents mycobacterium from disseminating into the blood.49 These TNF-mediated immune mechanisms may explain the reason for the increased risk of TB in patients receiving anti-TNF agents’ treatment. Several limitations in this study should be addressed. First, the review identified only a limited number of RCTs, with only two studies about golimumab and one about etanercept. Second, the relatively short follow-up period in the RCTs might have caused an underestimation of TB incidence rates. Third, the meta-analysis was limited to published scientific publications, and the omission of unpublished data from pharmaceutical trials may affect the pooled results. In summary, our results suggest that the risk of TB is doubled when patients with any condition are treated with anti-TNF-α drugs. When anti-TNF-α treatments are considered, the increased risk of TB should be part of the treatment decision-making process. Patients should be screened for LTBI and anti-TB prophylaxis or concomitant treatment should be considered. Further high-quality research regarding the long-term safety of biologics is needed to improve the safety of biological treatment in clinical use. The authors thank the authors of the primary studies and Dr Brian Buckley (Visiting Professor, Wuhan University) for assistance in preparation of the English language manuscript.
. An interferon-gamma release assay test performs well in routine screening for tuberculosis. Dan Med J 2014;61:A4856.
. Identification and management of latent tuberculosis infection. Am Fam Physician 2009;79:879–86.